Ten hours of two lane roads navigating the lowlands and snaking up into the mountains. Ten hours of traversing rivers, rural villages and alpine meadows. Ten hours of avoiding rock falls, random car sized potholes and speed bumps. Ten hours of bouncing along dirt roads for kilometre after kilometre of awe-inspiring beauty. Ten hours after our departure from Maseru, we finally arrived in Sehlabathebe National Park. 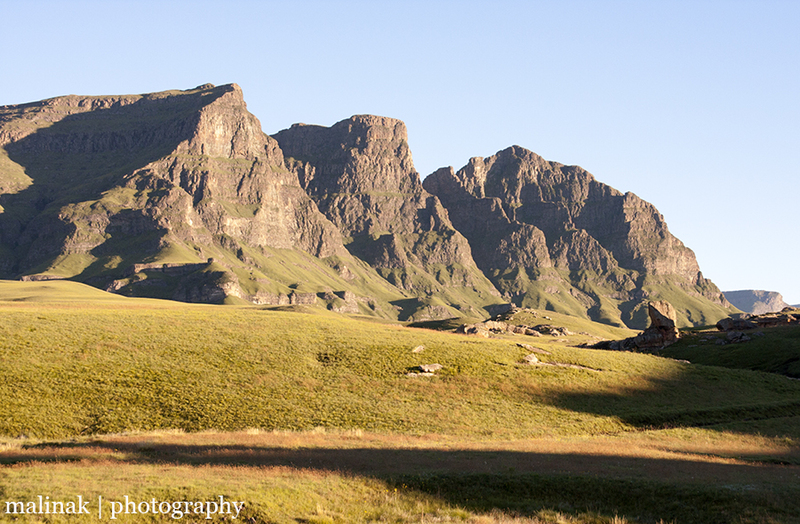 Nestled amongst the soaring peaks of the Maloti Mountains and staring out over the abyss of the Drakensberg Escarpment, Sehlabathebe was the first National Park in Lesotho. Like most things in Lesotho, it isn’t terribly far as the crow flies, maybe 300 kilometres, but it feels like it’s on the far side of the world. That feeling is amplified by the fact that there are almost no settlements near the park and so once inside the park’s boundaries, you have a better chance of seeing jackals than humans. Once past the small guard house and soon to be opened new lodge, there are literally no structures within the park with the exception of a few ruined shepherd shelters and a rather bizarre house. In the 1970’s, the then Prime Minister Leabua Jonathan decided he needed a hunting lodge, so he had a rather suburban looking house built in the middle of what is now Sehlabathebe. I am not sure if there were a lot of animals there to hunt or whether it was more of a convenient place to hole up at times. Regardless, the house has been operated as a rental property over the past few years by the Lesotho Tourism Board. Two months ago, however, they closed it for an undisclosed duration, but you are still allowed to camp on the grounds. We, and our friends Stacy and Cale, set up camp right next to a little babbling brook that flowed out of the once well stocked pond. Much to Cale’s chagrin, there were no fish in this little pond, but there is apparently a beaver. With a few trees offering a shady canopy and an unbroken expanse of grassland stretching out for a couple of kilometres, it was the perfect place to sit down and enjoy a beer while the braai got started. There is nothing to do in Sehlabathebe and that is the pure allure of the place. You sleep late, have a lazy breakfast and then wander off in one direction or the other looking vaguely for animals, flowers or just a good view. With this as our mantra, we walked out towards a waterfall, the location of which was described by the park ranger as being ‘towards the frog mountain and then head to your right.’ Admittedly the frog mountain was quite clear. It was the head to the right that lead to some discussion and random wanderings, especially as from the top of the frog we could not see anything remotely close to a waterfall. One of the unique features of the landscape of Lesotho is that it hides amazing natural wonders. 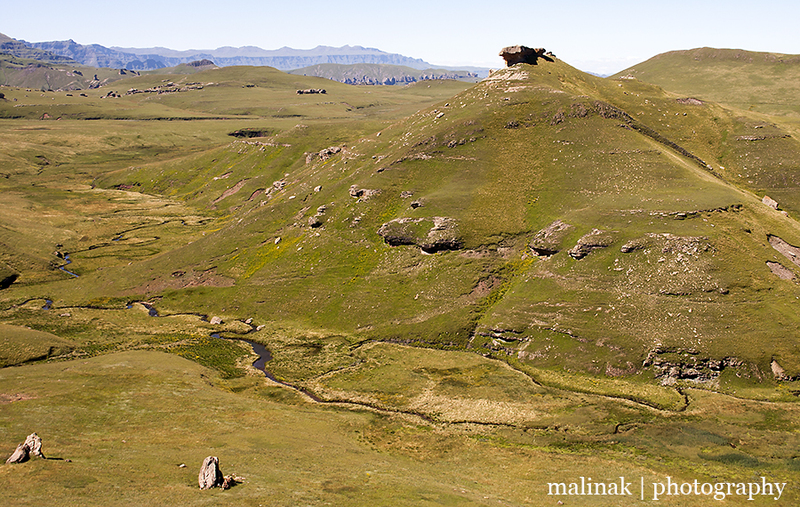 This is true across the country – Maletsunyane Falls near Semonkong just appear from nowhere. So we wandered along a twisty stream, cutting through the high grasses and across the rock strewn waterway in search of this waterfall. Then all of the sudden, it was there, practically at our feet. The path ran alongside of the falls and lead down to the lovely pool below. Though lovely to look at, it was icy cold even in the height of summer. That didn’t stop us from taking a chilly but refreshing swim! Cale decided not to join us in the water as he continued his unfortunately futile search for fish in the many streams that carve their way through the grasslands. He did provide me a nice little fly fishing lesson however, so I now understand the basics of casting, even if that lesson did lead to two lost lures and a snapped line, sorry Cale! The hike back from the falls turned into a marathon trek up and over a couple of mountains. It was completely unnecessary as we could have followed the same stream back past the frog and towards the camp, but it being early in the day and we being young and adventurous, we decided to hike straight up! Like so many random decisions made on the fly, this one proved advantageous as we were rewarded with amazing 360 degree views and even found a couple of abandoned shepherd shelters that had been built into the rock faces. We were exhausted by the end, but that just made dinner over an open fire taste all the better! Stacy is a professional botanist and therefore was in heaven all weekend. Sehlabathebe is covered in numerous flower species that are extremely rare to find in the wild and so invariably we would find Stacy kneeling down in the grass examining a small orchid or similarly delicate flower. It was infectious to be around someone who was so knowledgable and enthusiastic. With our limited knowledge and attention to flowers, it was incredible to see the many different petal, stem and seed structures through Stacy’s triple magnifier. The real find of the weekend was going to be spotting an extremely rare lily that was apparently growing in some of the rock pools near the camp. We set off up onto the plateau in search of them, but aside from some other new flowers we were unfortunately unable to locate the lilies. The journey was good fun nonetheless as we skirted the rock pools – some no larger than a puddle and others that could be safely classed as ponds in their own right. On the far side of the pools were a series of rock outcroppings twisted into many elaborate forms by the wind and rain that lashes the Drakensberg Escarpment. Some have formed perfect arches that frame the famous Three Bushmen peaks. These peaks cast an imposing watch over the whole area and could be an entire photographic collection as the sunlight hits them throughout the day and clouds roll across their faces. We weren’t able to climb them this time but when we go back that is going to be day one! The weekend went entirely too quickly and soon we embarked on the long drive once more. We attempted to cut across country on the new tar road to Semonkong, but were thwarted by construction works. So, once more around the lowlands we went. The Semonkong road would have been fantastically beautiful, but the drive around the perimeter of Lesotho is a treat, even if you did it just three days prior! Thanks to Stacy and Cale for all the good times, good food and good company – it was a fantastic weekend!